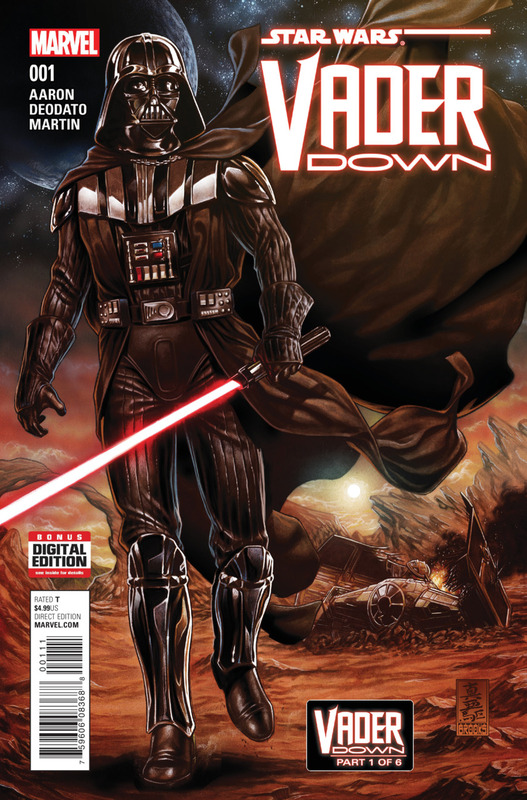 Star Wars Review & Spoilers — STAR WARS: VADER DOWN By Jason Aaron, Mike Deodato, Frank Martin Jr. Don’t Force The Dark Lord’s Hand!! Dum dum dum da da dum da da dum. Cue the ominous music: Darth’s theme song. Badass doesn’t begin to describe this former Jedi. The premise is elegant simplicity – one man can take down an entire fleet of X-Wings without flinching!! 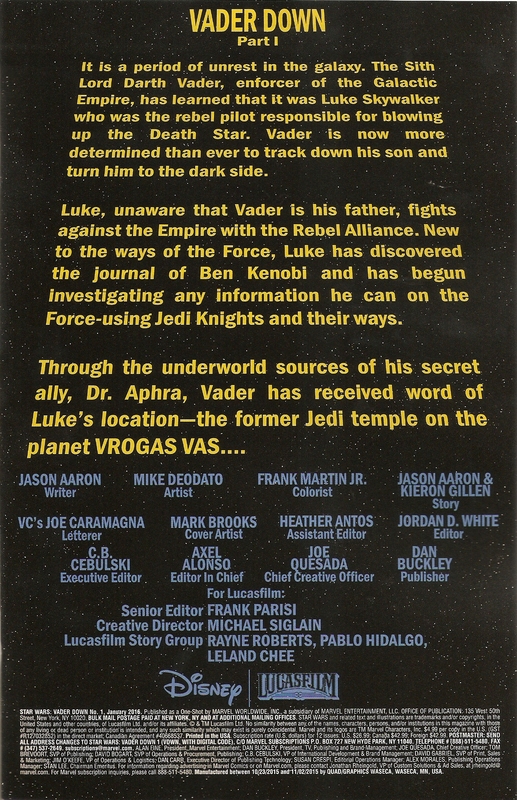 The man once known as Anakin Skywalker is determined to find his son Luke. Intel has him at the planet Vrogas Vas. Expecting to spend alone time with his rightful heir, there is company. 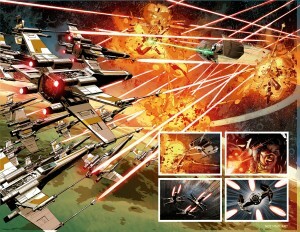 The Rebel Forces (re)act instinctively and engage the TIE Fighter. 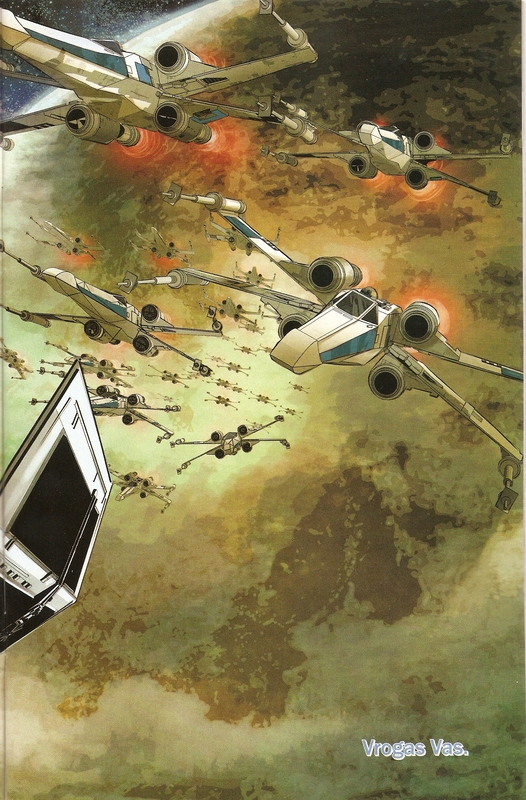 When the pilots catch word that the Lord of the Sith is the sole occupant, their determination increases a hundredfold. They fire without hesitation but remain skeptical. 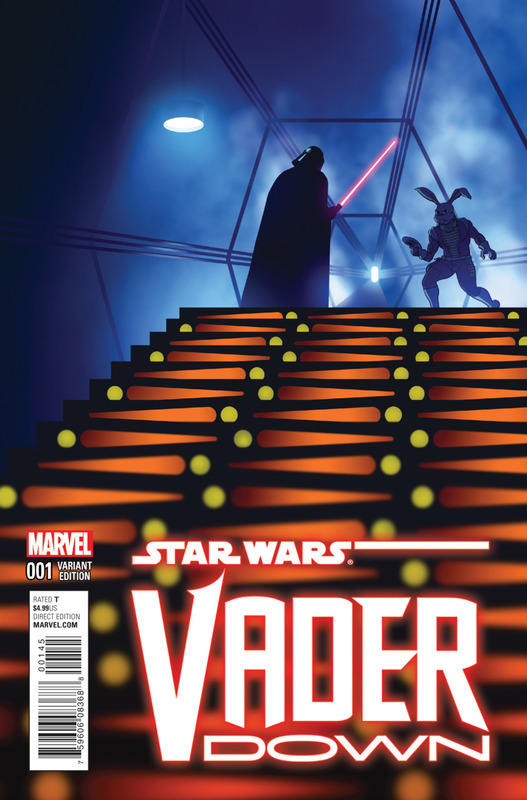 The younger Skywalker instinctively knows that the ebon-armored fiend is present. 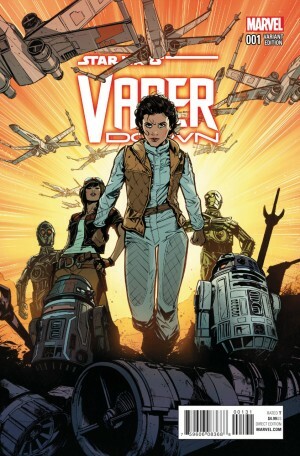 The Force has established a connection. Defiantly and fearlessly, Luke propels forward much to Vader’s surprise. Instant impact. 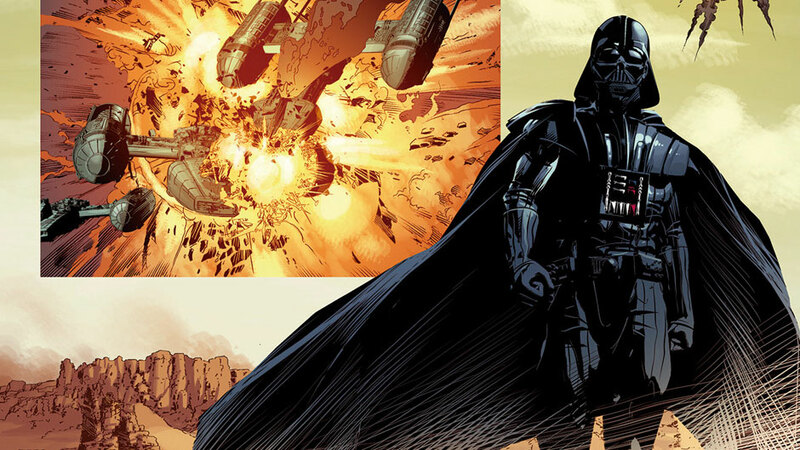 This is the perfect opportunity to put a major dent in the Empire – Darth has gone down with his ship. An infantry is dispatched to dispose of the diabolical blackguard. News travels at light speed. Leia will join another fleet that is to aid in DV’s capture. Han thinks she has gone off her rocker. When she mentions the planet, Han realizes that Luke is there and shows concern. 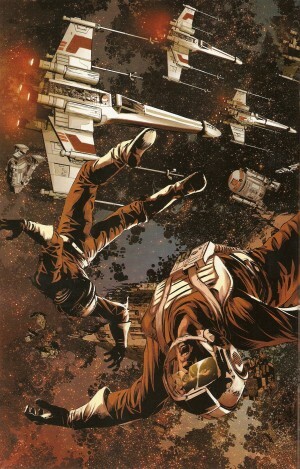 He decides to hightail it in the Millennium Falcon with Chewie, the Princess, and C3PO in tow. 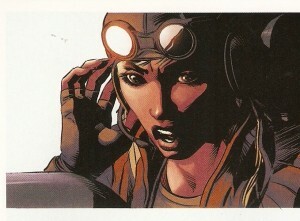 The parallel scene has Aphra contemplating her next move. She must retrieve her master DOA. Triple-Zero offers to unleash his homicidal tendencies. 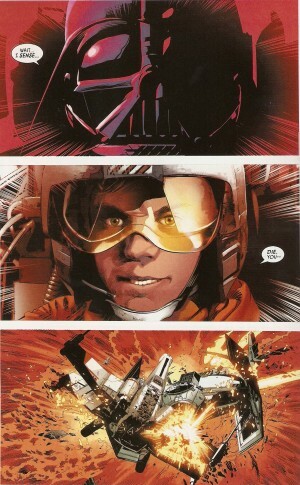 She informs him he will get his wish as they rendezvous to the Rebel base. Bee Tee chimes in, ready to participate. Vader is down but definitely not out. He tears apart entire ships with a wave of his hand. Luke and R2D2 are unhurt. They begin trekking to the base. 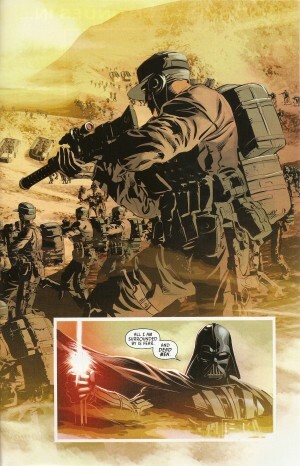 Vader is colder than the metal he sports. He has no fear whatsoever. He is swatting flies. Numerous troops surround him. The Dark Lord tastes their fear and assures them of imminent death. 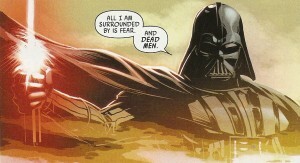 As he utters this, he activates his lightsaber. 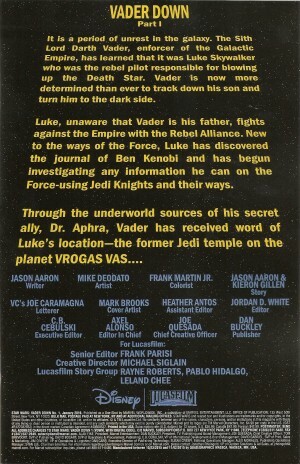 Jason Aaron should have tried his hand at the Star Wars universe eons ago!!! 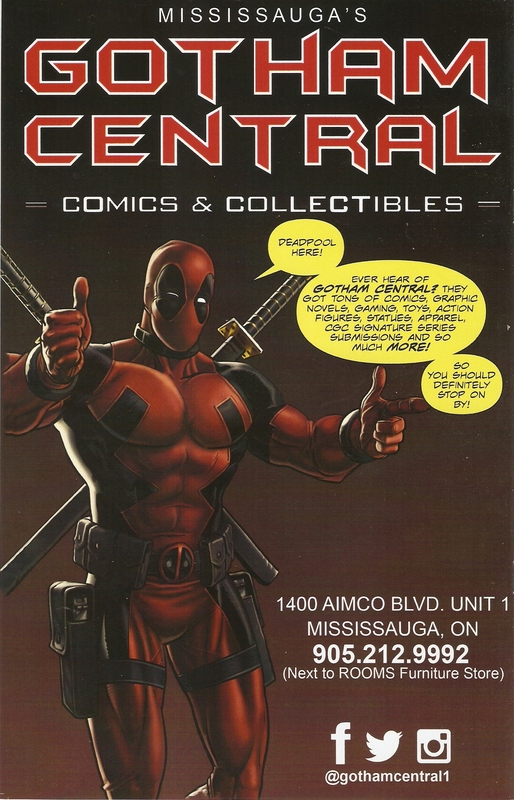 He streamlines the extensive history. He deconstructs the characters to their most basic nature. There is no disservice in his interpretations. The title for this arc is misleading. 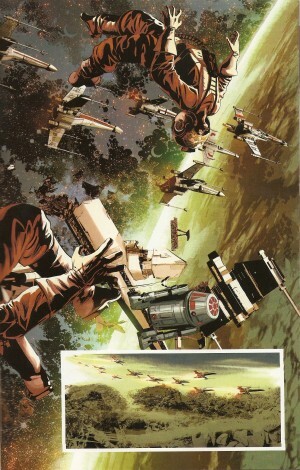 There’s no way in hell that the Rebel Alliance will emerge victorious. If anything, DV will use his unmatched power to diminish his opponents. 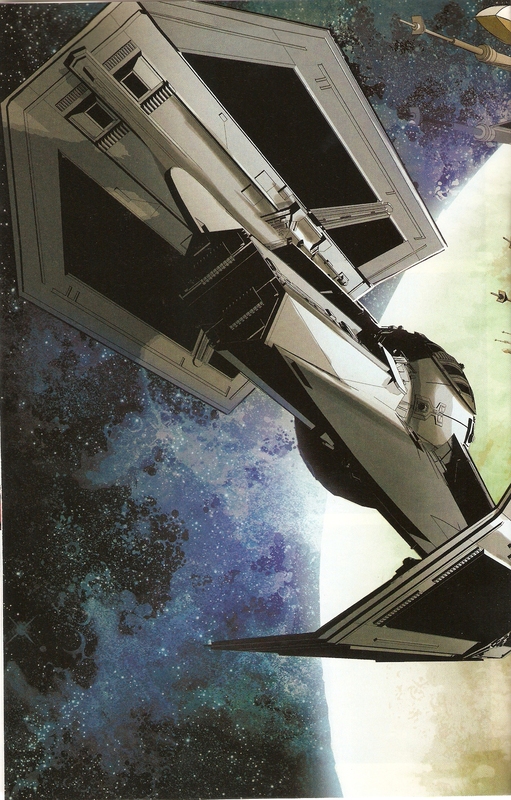 The newer characters (Aphra, 0-0-0, BT-1) are seamlessly woven into the tapestry as if they have always been part of the mythos. Han refuses to let a good guy like Luke be in jeopardy. Friends are an invaluable asset. The buzz around this one-shot is that it is the first official crossover between the two main series: STAR WARS and DARTH VADER. The event is a cohesive self-contained six-part story. It’s a vast understatement to state the centre of attention. I’m gonna do it anyways >_< Vader is a minimal conversationalist and rightly so. His actions define his character, establish his reputation, and augment the respect of those who dare not speak his name. The resisters are mere distractions. They are beneath his skill set. The one exception is Luke. For the immovable face to express awe is a rarity. Mike Deodato has hit the pinnacle of his career!! He has tackled the major characters from the Big Two but to enter a gigantic galactic franchise such as this one is akin to the Medal of Valor. Mr. Deodato has perfected anatomy and faces. His greatest achievement is the glorious and gratuitous use of four double-page spreads. The man deserves multiple awards for the fine detail in the space crafts, the debris, the deceased, and the desert. 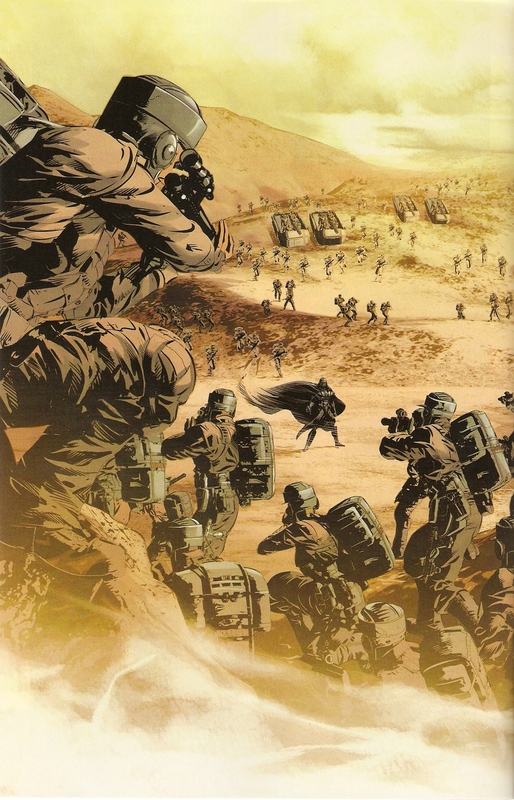 The standoff at the end is a hyper realistic representation of the armed forces. 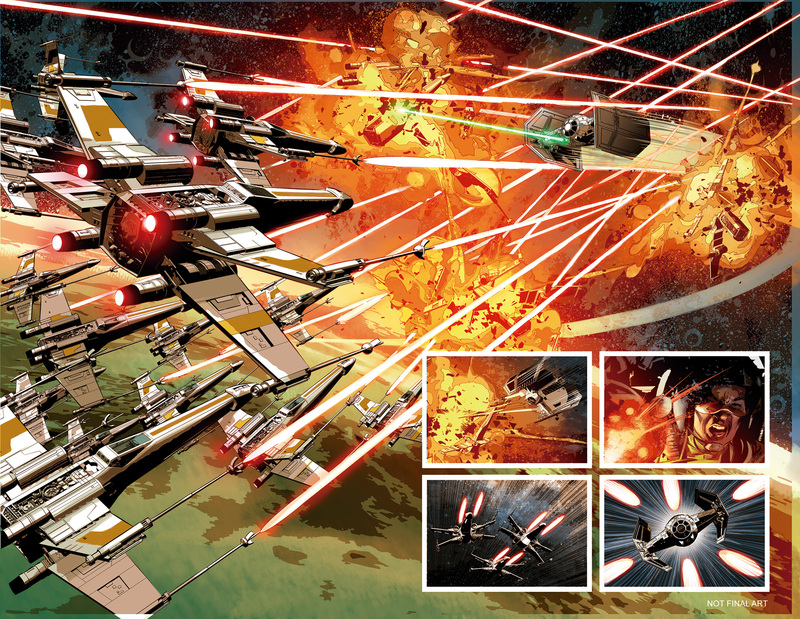 Frank Martin provides rich texture to the pencils and inks. There is a liquid clarity to his work. If I didn’t know any better, I’d swear I was experiencing CGI in HD. The red reflecting off DV’s face plate paints him as the Devil of that sector of space. The tone is sombre. Even in the barren terrain, the light does not break through the grainy filter. Joe Caramagna regulates the dialogue. He has some amusement with Chewie’s identifiable guttural sound. I wonder if 3PO and Zero sound alike. The speech bubbles are identical. That would definitely ramp up the creep factor. 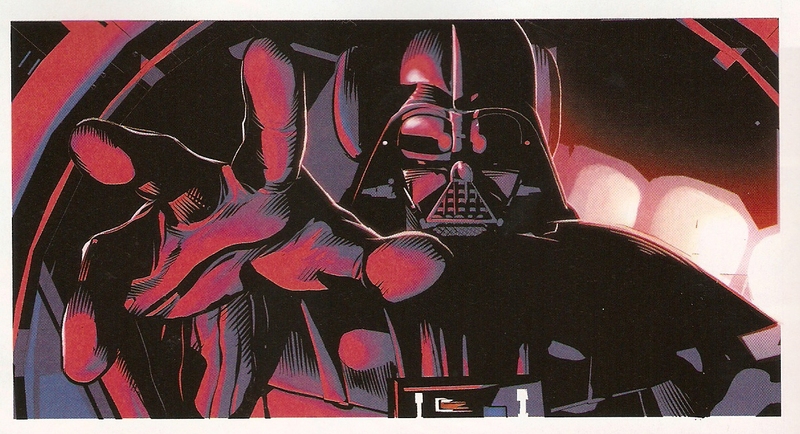 The Force is ready to burst through Vader. He is holding back to lull his enemies into a false sense of security. They are playthings that merit less than an iota of his attention. 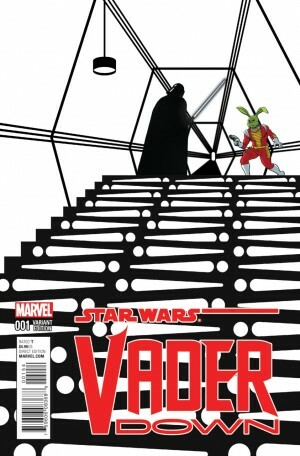 I’ve mentioned this a few other times this year reviewing the other titles – it’s completely justifiable that the Star Wars books are the mucho money-makers for Marvel Comics. I give this tale 9.5 out of 10.